When I was maybe ten years old, electronic calculator became available. I lusted after this basic scientific model, the size of a paperback book, at my local stationary store for a year. My dad bought it for me and I loved that thing. It has all the log and trig functions. Since then, I slowly saved money and traded up for the latest in model. Remember the casio that also play music? 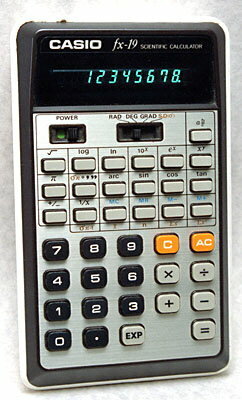 Then a fancy Casio that has a 1/100th second timer, which I used in all my high school advanced Physics classes. Then the HP 27S that does financial and statistical calculations, too much of a geek to use a 19B even for my MBA classes. How far we have come? When was the last time you used a physical calculator? I use my iPhone most of the time, or use Google. Next generation of children may never have to use one. But for my generation, that was my very first personal, electronic gadget.